Why is water so important for human health? The answer is, because our bodies are composed of 70% liquid. Thirst is one of the body's response that requires fluid intake time soon. Based on the facts, all organs of the human body needs fluids, or water in sufficient quantities to support various activities. In fact, studies the scientists recommend, replacing carbonated beverages and fruit juices with water could reduce the risk of women from diabetes. In fact, research initiated by researchers from the Harvard School of Public Health indicates, replacing sugary drinks with water can also help prevent metabolic disorders. Another study conducted in the UK revealed that, by drinking water as much as 500 ml or about two glasses about 30 minutes before a meal, could be expected to lose weight. Despite so much the importance of water for health, it is advisable also to not excessively in taking it. Despite so much the importance of water for health, it is advisable also to not excessively in taking it. Because health experts in Britain, warned of the dangers of drinking too much water. This warning came out after a woman was treated because of water intoxication. A woman aged 59 years, increasing water intake, after suffering symptoms of a urinary tract infection. By drinking 250 ml of water every half hour, she hopes to get rid of that disease. What is the normal dose of water consumption per day? Fluid needs of each person is different. On average, for adult women, it is advisable to drink about eight glasses a 200 ml per day or a total of 1.6 liters. Meanwhile, men are advised to drink about 10 glasses a 200 ml or a total of 2 liters per day. Aside from beverages, foods can also provide body fluid intake at about 20 percent (read recommended daily water intake). Fluid from food is mainly obtained from fruits and vegetables, such as spinach and watermelon contains 90 percent water. To note, people can lose fluids not only during urination, but also when sweating, breathing and defecating. Some of the signs that can help you recognize the body is lack of fluids, such as headache, feeling less energetic, and the color of urine is dark or not as much as usual. Exercising or being physically active. Pregnancy and lactation. Pregnant women are advised to consume about 2.3 liters of water a day, while women who breast-feed consume 3.1 liters of water per day. Approximately 70% of the human body consists of water. Drinking enough water will maintain the fluid balance of the body, which helps transport nutrients in the body, regulate body temperature, digest food, and much more. If the fluid level in the body to normal levels, the body does not experience a disruption in food digestion and absorption function, circulation, kidney, and is important in maintaining body temperature. As we know that the liver converts fat into energy. Without adequate water intake, the kidneys will not function at optimum levels. As a result, the heart will work extra hard to help the kidneys perform their duties. And ultimately liver can not function properly. Some fat will remain in the body and can not be converted into energy. This is what causes weight gain. Drinking water every day in sufficient quantity allows the liver to perform its function to burn fat and convert it into energy maximally. Water dissolves nutrients and helps in digestion of food. Because water is an inorganic substance, the water is not ingested. Water quickly pass through the small intestine and is largely absorbed and then helped serve as one component of mucus that leftover food substances can come out as faeces. Water also serves as a vibration-resistant pads (shock absorbing cushion fluid) in body tissue, for example in the brain, eyes, spinal cord, and pockets amniom in the womb. Additional benefits of water that is functioning as a lubricant in the form of joint fluid, allowing the joint to move properly and reduce friction between joints. The main components of the cell, except the fat cells, is water, which is about 70-85 percent. 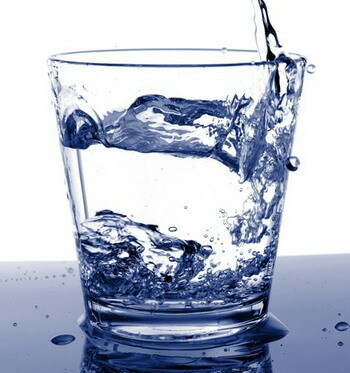 Water is very important in making a variety of body fluids, such as blood, hormones, gastric juices, enzymes and so on. The water is also present in muscle and useful to maintain muscle tone so that the muscles are able to contract. The structure of water consists of two hydrogen atoms and one oxygen atom, so that with this structure, the water can easily move from one cell compartment to another cell compartment, from one system to the other systems of the body. Water is an effective transport medium. In the respiratory system, water helps transport oxygen throughout the body. Water generates heat, absorbing and transferring heat to the entire body so that it can keep the body temperature remains stable. Through sweat production consists largely of water and salt, water has benefits to cool the body temperature.